American Creation by Joseph J. Ellis | Blah! The founding of the United States of America is of near mythic proportions in our history, and rightly so. The men that revolted against Great Britain, developed the Constitution, and guided our country through the rocky first steps have become men of legend. Because of this, it is often hard for us to remember that these men, as great as they were, were also just human, like the rest of us, with their virtues and vices, passions and foibles. 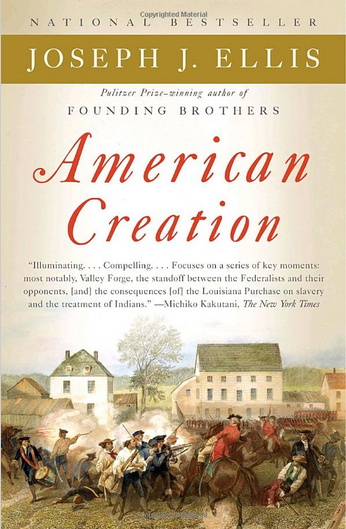 In American Creation, Joseph J. Ellis puts the founding of America in the context of the people who were responsible. Ellis is a master story teller, a first class historian with an ear for telling history. Rather than a chronology of the founding, he gives us a series of episodes that highlight not only the grand achievements of the era, but also the failures, often the result of the very failings of these men that do, in the end, make them human. Ellis chooses 6 episodes that not only illustrate the role the founders had in the formation of the US, but also the role that happenstance played. He describes the writing of the Declaration of Independence, the winter at Valley Forge as a decisive turning point in how Washington fought the Revolutionary War, the arguments by Madison for a strong federal government in the Constitution, the efforts by Washington and his cabinet to find a solution to the country’s relationship with the Native Americans, the formation of the Democratic party by Madison and Jefferson, and Jefferson’s exercise of the same near-monarchial power he so vehemently despised when he executed the Louisiana Purchase. These stories describe how the passions of these men often led them to live political lives full of hypocrisy, arguing on one side of an issue that they had been the most vocal opponents of. However, these men knew their place in history and worked to massage how future generations might judge their place in history. The story of Washington trying to reach peace with the Indians was particularly interesting as I had not been aware of this history. In the end, Washington did make a treaty with the Creek Nation of the south, but simple demographics rendered it meaningless as white settlers kept pushing west. For the same reason the British could never win the Revolutionary War (once Washington stopped directly engaging them), so the US government could never stop the displacement of the Native Americans from the American frontier. However, probably the most fascinating part, to me, was about the writing and subsequent adoption of the Constitution. Madison was the most vocal and ardent advocate of a strong central government, a government he proposed should have veto power over the states. He lost that battle. Because of the inability of the different sides to come to agreement on the questions of executive authority and the relationship between federal and state power, these were left rather vague. Ellis argues that what the founders thus created was not a document that had the answers to all of their, and subsequent Americans’, questions, but a framework for arguing and deciding these questions. The vagueness let the government expand and contract as needed, as history dictated. They created a living document — a living government — that could adapt with time. To me, incidentally, this is the exact opposite that those that read the Constitution literally and try to understand the intentions of the founders, try to do. There was no single intention of the founders; rather, they created a system that was inherently unclear on many important and central questions precisely because they didn’t have a clear answer. In addition to the early country’s relationship with the Native Americans, Ellis describes the complex relationship the founders, and the country as a whole, had with slavery. These two issues he points out as the two biggest failings of the founders — their inability to address them. Ellis argues that maybe there was no solution, that the two problems were inherently insoluble. In any case, both are two stains that the founders knew posterity would judge them for, and rightly so. In the end, this was one of the most interesting books I’ve read on the founding of the US. Ellis provides insight into what these men really achieved, what was remarkable about those achievements, even the creation of political parties that we so often, today, rail against. I learned a great deal about how our country was founded, who the men involved were, and how different our country might have been if a few winds had blown in just slightly different directions. This is a book I highly recommend to all who care about the foundations of our republic. Living in France, I have read all Mr.Ellis’ books and concur with your appraisal of his work. Just two things that need to be clarified for me: I do not think that Madison was very much in favor of a federalist system since he sided with Jefferson who was a staunch advocate of states’rights. If Madison did not go all the way with his mentor, he must have disapproved a too centralized charter, hence the hailed “checks and balance” equilibrium…. Second, Jefferson claimed to be a republican vs the federalists. Who is today’s heir of Jefferson: the Republicans or the Democrats??? ?